Download "Search over 4 million homes... Homes New Homes Rentals Luxury Homes"
2 leader in integrating internet, mobile and print Our revolutionary, CUTTING- EDGE SYSTEM Thousands and thousands of real estate professionals across the country turn to HarmonHomes.com for their marketing needs, and more are joining every day. Why? Because we deliver results. Our revolutionary, cutting-edge system is a total marketing solution. We blend the strengths of internet, mobile and print marketing into one seamless HarmonHomes.com strategy with unmatched selling power. We put the power of HarmonHomes.com to work for you. What is HarmonHomes.com? 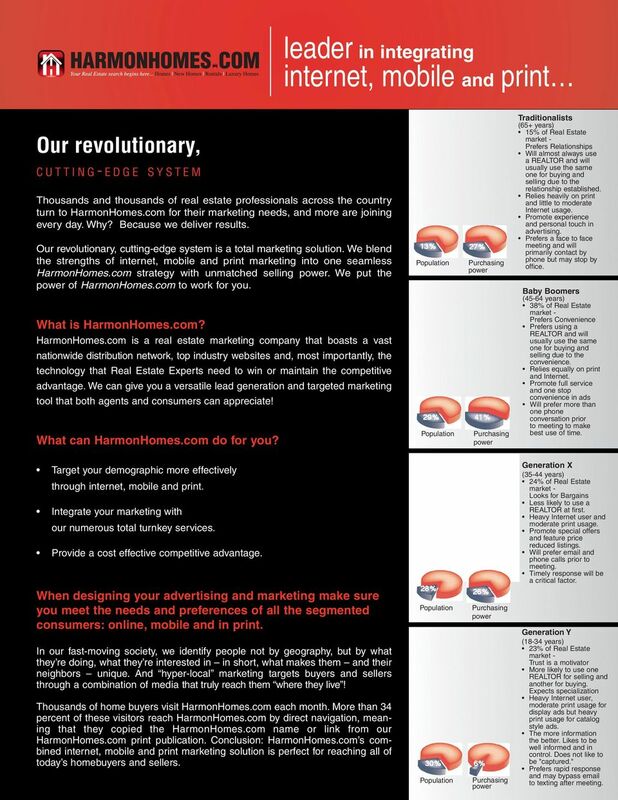 HarmonHomes.com is a real estate marketing company that boasts a vast nationwide distribution network, top industry websites and, most importantly, the technology that Real Estate Experts need to win or maintain the competitive advantage. We can give you a versatile lead generation and targeted marketing tool that both agents and consumers can appreciate! What can HarmonHomes.com do for you? Target your demographic more effectively through internet, mobile and print. Integrate your marketing with our numerous total turnkey services. Provide a cost effective competitive advantage. When designing your advertising and marketing make sure you meet the needs and preferences of all the segmented consumers: online, mobile and in print. In our fast-moving society, we identify people not by geography, but by what they re doing, what they re interested in in short, what makes them and their neighbors unique. And hyper-local marketing targets buyers and sellers through a combination of media that truly reach them where they live! Thousands of home buyers visit HarmonHomes.com each month. More than 34 percent of these visitors reach HarmonHomes.com by direct navigation, meaning that they copied the HarmonHomes.com name or link from our HarmonHomes.com print publication. Conclusion: HarmonHomes.com s combined internet, mobile and print marketing solution is perfect for reaching all of today s homebuyers and sellers. 13% 27% Population 29% Population 28% Population Purchasing power 41% Purchasing power 26% 30% 6% Population Purchasing power Purchasing power Traditionalists (65+ years) 15% of Real Estate market - Prefers Relationships Will almost always use a REALTOR and will usually use the same one for buying and selling due to the relationship established. Relies heavily on print and little to moderate Internet usage. Promote experience and personal touch in advertising. Prefers a face to face meeting and will primarily contact by phone but may stop by office. Baby Boomers (45-64 years) 38% of Real Estate market - Prefers Convenience Prefers using a REALTOR and will usually use the same one for buying and selling due to the convenience. Relies equally on print and Internet. Promote full service and one stop convenience in ads Will prefer more than one phone conversation prior to meeting to make best use of time. Generation X (35-44 years) 24% of Real Estate market - Looks for Bargains Less likely to use a REALTOR at first. Heavy Internet user and moderate print usage. Promote special offers and feature price reduced listings. Will prefer and phone calls prior to meeting. Timely response will be a critical factor. Generation Y (18-34 years) 23% of Real Estate market - Trust is a motivator More likely to use one REALTOR for selling and another for buying. Expects specialization Heavy Internet user, moderate print usage for display ads but heavy print usage for catalog style ads. The more information the better. Likes to be well informed and in control. Does not like to be "captured." Prefers rapid response and may bypass to texting after meeting. 4 online advertising HarmonHomesPages.com Give your sellers the best advertising coverage with leveraging the power and reach of HarmonHomesPages.com to quickly sell homes and generate new business. HarmonHomesPages.com is an affordable solution for getting your listings in front of active homebuyers by creating individual property websites to drive more results directly to you. Why HarmonHomesPages.com Individual property sites - Creates SEO Unlimited Listings Upload virtual tours Display phone number, website links and Live mapping of each property Premier Listing Advantage Gain Visibility For Your Listings! Premier Listing Advantage on HarmonHomes.com highlights your listings so active homebuyers searching for homes in your area won t miss them. More branding exposure and lead routing capabilities to generate more business. Why Premier Listing Advantage? Competitive Advantage: Increase your visibility in the search results, plus a red Just Listed banner for the 14 days. Branding: Display your company logo, your photo and profile with links directly to your website on the listing detail page. Targeted Leads: Each listing includes a contact form for more information. All forms are routed directly to your . Increased Exposure: Syndicate your listings to all the online listing partners through ListingsRocket, reaching over 100 million monthly visitors. Featured Listing Featured Listings on HarmonHomes.com give that special listing maximum exposure to thousands of homebuyers searching for homes each month. Featured Listings are clicked on 10 times more than basic listings, driving more leads back to you! Featured Listings are found at the top of th search results pages. Neighborhood and City Sponsorship Ads You will increase your exposure to motivated homebuyers in your preferred zipcode(s) and or City(s). It s a great way to build awareness and grow your business. Large ads will appear on the search results pages and listing directory pages. 5 offline advertising Display Advertising Your marketing message is exposed to thousands of visitors to the HarmonHomes.com portal each month, as well as readers who search our free targeted HarmonHomes.com print publications. Build your brand, promote your services and feature your listings. HarmonHomes.com helps you meet all your prospects where they are, and speak in the language they want to hear. Some buyers use the internet, while there are other buyers who start their search with print. There is a need to reach all segmented consumers which HarmonHomes.com provides. 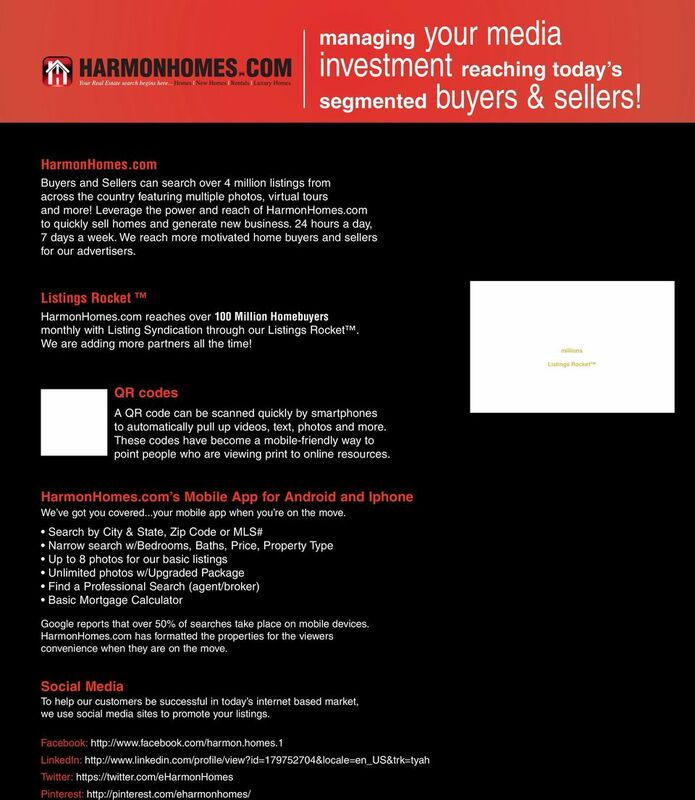 Harmonhomes.com is the only provider of full-spectrum real estate marketing and media services - services that include brand advertising, local property listing exposure, website development, search engine marketing and lead-generation solutions. 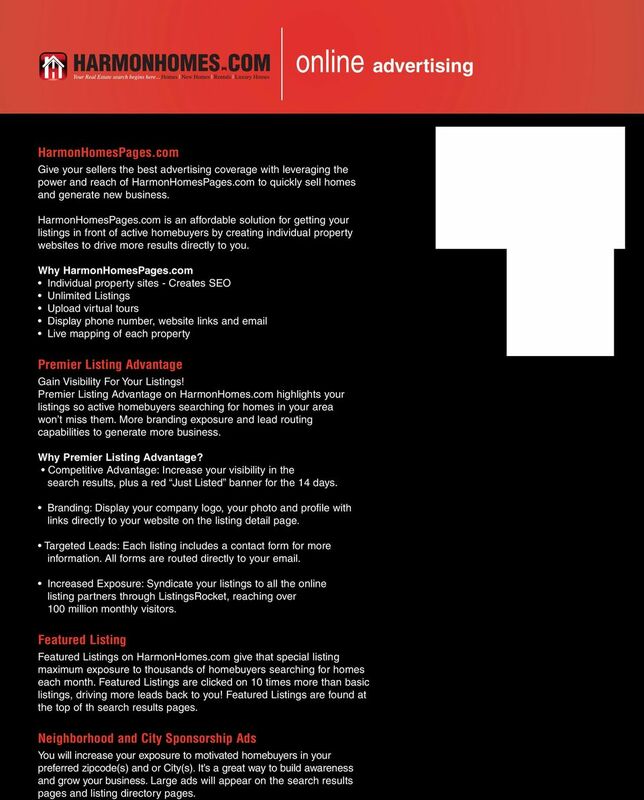 Your marketing message is exposed to over 100 million buyers and sellers monthly, as well as 2.4 million readers who search our free targeted HarmonHomes.com publications across the United States. This combination of Searchable and scannable media is unique to HarmonHomes.com customers, giving you the edge in high visibility and staying power in the minds of local buyers and sellers as well as relocation customers. Digital Distribution on ebooks HarmonHomes.com provides each publication digitally online, through the interactive, searchable, digital ebook! eharmonhomes.com This combination of searchable and scannable media is unique to HarmonHomes.com customers, giving you the edge in high visibility and staying power in the minds of local buyers and sellers as well as relocation customers. AdNet/AdBuilder We give you control and take the work out of SOLD! AdBuilder gives you flexibility with unique design options to create your own ad to your exact specifications. Multiple Photo options Immediate online proofing Over 150 templates to choose from Work on your ad on your own time Attractive background possibilites Repeat your ad with one click Extended proof deadline Powerfully fast and simple online ad creation! STEP 1: STEP 2: STEP 3: Place your listings View your proof Approve your listings, and you re done! 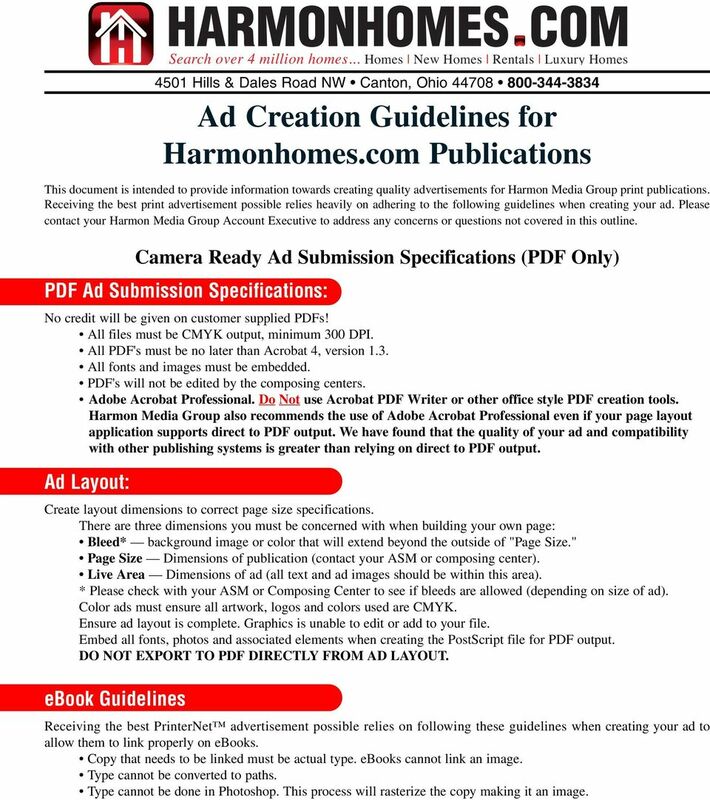 6 HARMONHOMES.COM Search over 4 million homes... Homes New Homes Rentals Luxury Homes 4501 Hills & Dales Road NW Canton, Ohio Ad Creation Guidelines for Harmonhomes.com Publications This document is intended to provide information towards creating quality advertisements for Harmon Media Group print publications. Receiving the best print advertisement possible relies heavily on adhering to the following guidelines when creating your ad. Please contact your Harmon Media Group Account Executive to address any concerns or questions not covered in this outline. 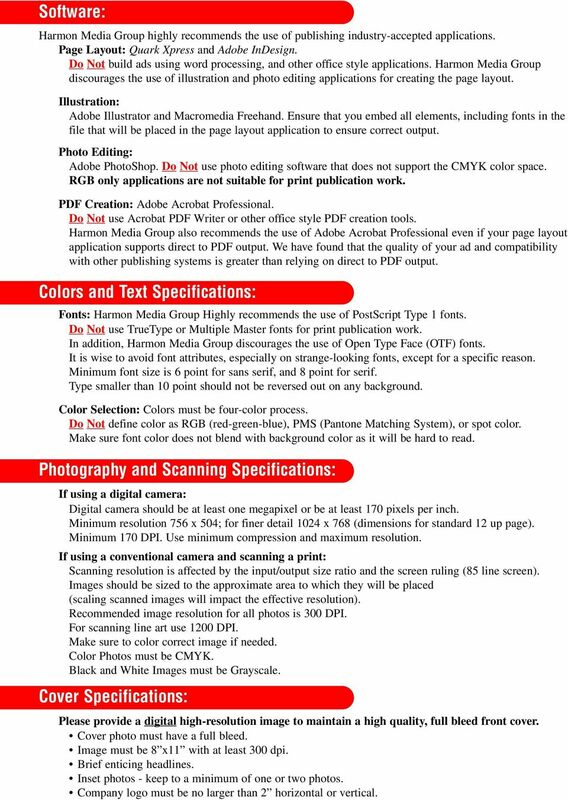 Camera Ready Ad Submission Specifications (PDF Only) PDF Ad Submission Specifications: No credit will be given on customer supplied PDFs! All files must be CMYK output, minimum 300 DPI. All PDF's must be no later than Acrobat 4, version 1.3. All fonts and images must be embedded. PDF's will not be edited by the composing centers. Adobe Acrobat Professional. Do Not use Acrobat PDF Writer or other office style PDF creation tools. Harmon Media Group also recommends the use of Adobe Acrobat Professional even if your page layout application supports direct to PDF output. We have found that the quality of your ad and compatibility with other publishing systems is greater than relying on direct to PDF output. 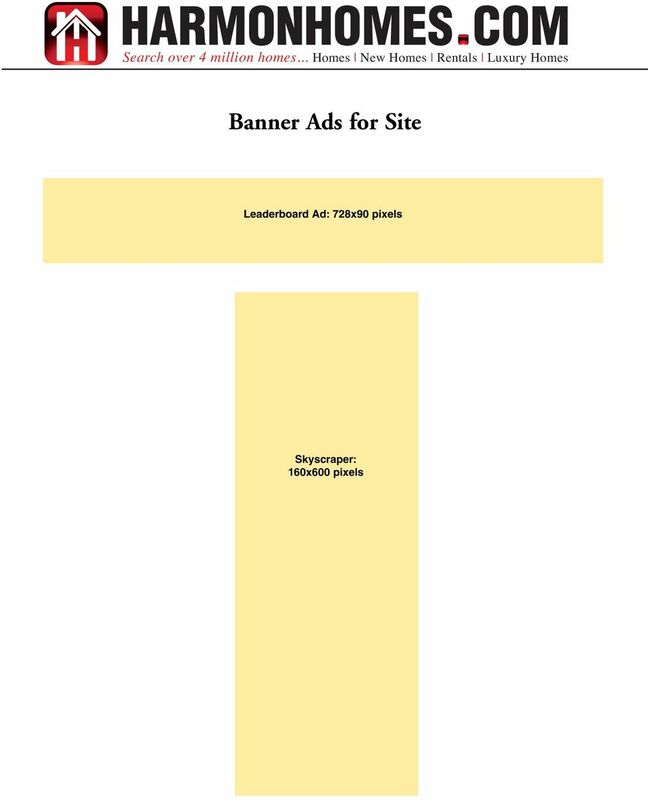 Ad Layout: Create layout dimensions to correct page size specifications. There are three dimensions you must be concerned with when building your own page: Bleed* background image or color that will extend beyond the outside of "Page Size." 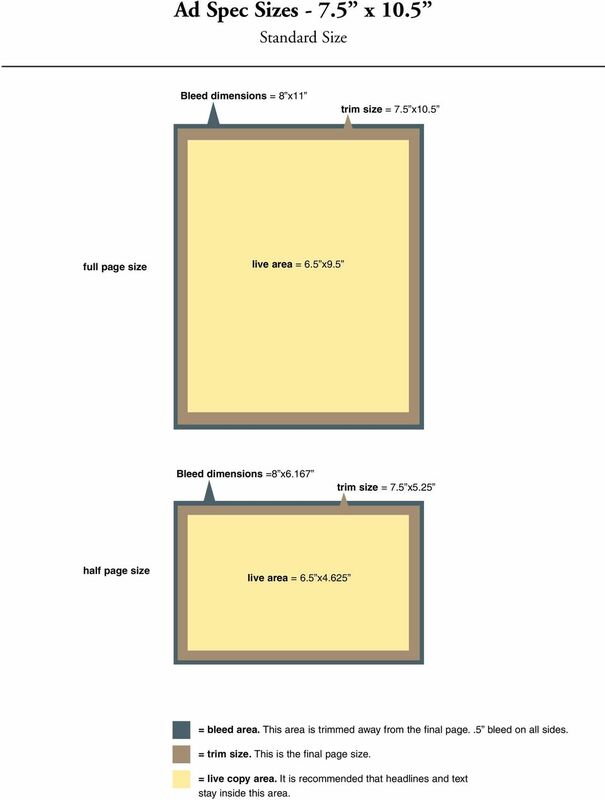 Page Size Dimensions of publication (contact your ASM or composing center). Live Area Dimensions of ad (all text and ad images should be within this area). * Please check with your ASM or Composing Center to see if bleeds are allowed (depending on size of ad). Color ads must ensure all artwork, logos and colors used are CMYK. Ensure ad layout is complete. Graphics is unable to edit or add to your file. Embed all fonts, photos and associated elements when creating the PostScript file for PDF output. DO NOT EXPORT TO PDF DIRECTLY FROM AD LAYOUT. ebook Guidelines Receiving the best PrinterNet advertisement possible relies on following these guidelines when creating your ad to allow them to link properly on ebooks. Copy that needs to be linked must be actual type. ebooks cannot link an image. Type cannot be converted to paths. Type cannot be done in Photoshop. This process will rasterize the copy making it an image. 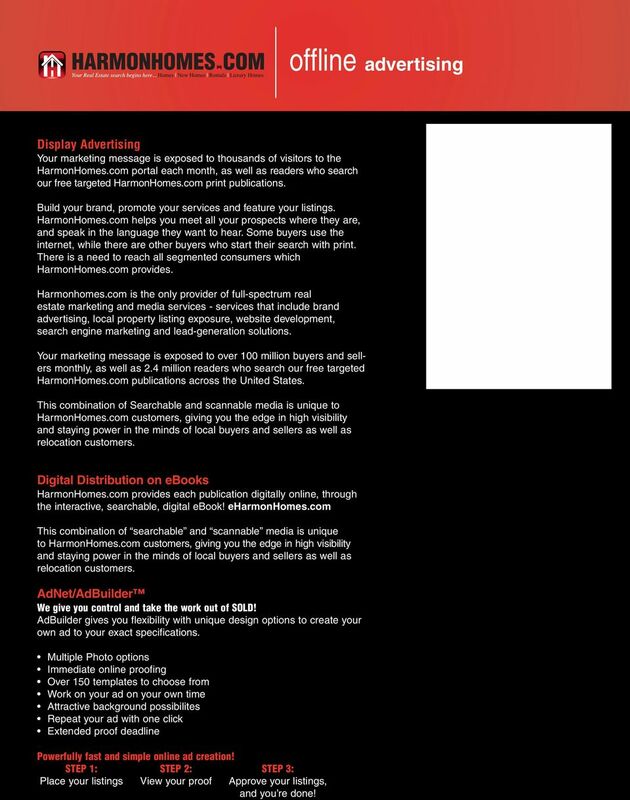 7 Software: Harmon Media Group highly recommends the use of publishing industry-accepted applications. Page Layout: Quark Xpress and Adobe InDesign. Do Not build ads using word processing, and other office style applications. Harmon Media Group discourages the use of illustration and photo editing applications for creating the page layout. Illustration: Adobe Illustrator and Macromedia Freehand. Ensure that you embed all elements, including fonts in the file that will be placed in the page layout application to ensure correct output. Photo Editing: Adobe PhotoShop. Do Not use photo editing software that does not support the CMYK color space. RGB only applications are not suitable for print publication work. PDF Creation: Adobe Acrobat Professional. Do Not use Acrobat PDF Writer or other office style PDF creation tools. Harmon Media Group also recommends the use of Adobe Acrobat Professional even if your page layout application supports direct to PDF output. We have found that the quality of your ad and compatibility with other publishing systems is greater than relying on direct to PDF output. Colors and Text Specifications: Fonts: Harmon Media Group Highly recommends the use of PostScript Type 1 fonts. Do Not use TrueType or Multiple Master fonts for print publication work. In addition, Harmon Media Group discourages the use of Open Type Face (OTF) fonts. It is wise to avoid font attributes, especially on strange-looking fonts, except for a specific reason. Minimum font size is 6 point for sans serif, and 8 point for serif. Type smaller than 10 point should not be reversed out on any background. Color Selection: Colors must be four-color process. Do Not define color as RGB (red-green-blue), PMS (Pantone Matching System), or spot color. Make sure font color does not blend with background color as it will be hard to read. Photography and Scanning Specifications: If using a digital camera: Digital camera should be at least one megapixel or be at least 170 pixels per inch. Minimum resolution 756 x 504; for finer detail 1024 x 768 (dimensions for standard 12 up page). Minimum 170 DPI. Use minimum compression and maximum resolution. If using a conventional camera and scanning a print: Scanning resolution is affected by the input/output size ratio and the screen ruling (85 line screen). Images should be sized to the approximate area to which they will be placed (scaling scanned images will impact the effective resolution). Recommended image resolution for all photos is 300 DPI. For scanning line art use 1200 DPI. Make sure to color correct image if needed. Color Photos must be CMYK. Black and White Images must be Grayscale. Cover Specifications: Please provide a digital high-resolution image to maintain a high quality, full bleed front cover. Cover photo must have a full bleed. Image must be 8 x11 with at least 300 dpi. Brief enticing headlines. Inset photos - keep to a minimum of one or two photos. Company logo must be no larger than 2 horizontal or vertical. 8 Ad Spec Sizes x 10.5 Standard Size Bleed dimensions = 8 x11 trim size = 7.5 x10.5 full page size live area = 6.5 x9.5 Bleed dimensions =8 x6.167 trim size = 7.5 x5.25 half page size live area = 6.5 x4.625 = bleed area. This area is trimmed away from the final page..5 bleed on all sides. = trim size. This is the final page size. = live copy area. It is recommended that headlines and text stay inside this area. A big behind gets noticed! Take advantage of our media products to reach the Blues community in 2016! Covering all aspects of international education around the world.